I love my Kindle. One of my favorite features is the ability to sync highlights across devices. Depending on my purpose for reading, I will often reorganize those highlights in Evernote so I can quickly refer back to the best ideas and practices. Long ago I was able to see my highlights through the web browser, then copy and paste them into Evernote. At some point Amazon restricted the ability to copy this content. Not wanting to retype my notes (I am a happy highlighter), and not finding a workaround, I went back to print books and post-it notes. Not the most efficient method for needs, but it was better than nothing. A few weeks ago I stumbled upon Norbauer's Bookcision. This bookmarklet captures the precious highlights (with location) into a copy friendly format. Chrome users can also download the page as text, XML, or JSON. Notes are not captured, and in my experience have caused error messages. To install, simply drag the button to the bookmark bar. 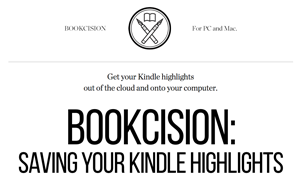 To capture your highlights: open the book through Amazon Cloud Reader in your browser, click the bookmarklet.